Some action popped up the past hour or so on the far westside of the metro area. 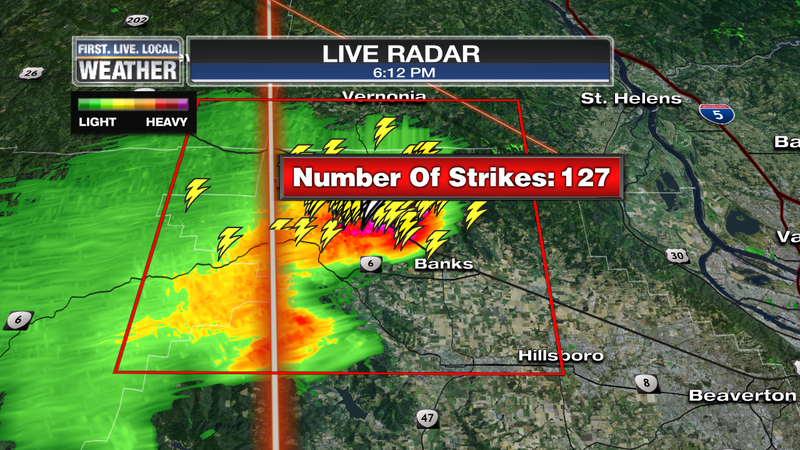 Take a look…easily a couple hundred lightning strikes in extreme western Washington County the past hour or so. 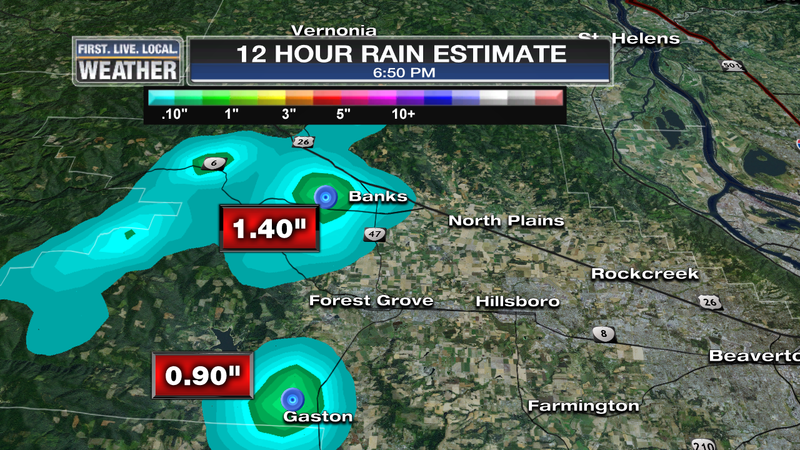 Very heavy rain has fallen just west of Banks and just west of Gaston. The outflow boundaries (cool air surging out the bottom of the storms) may fire up new storms much closer in to the city over the next hour or two. Just 11 miles east at KPTV in Beaverton we still have a light east/southeast wind. This entry was posted on Thursday, May 21st, 2015 at 6:55 pm and is filed under Weather. You can follow any responses to this entry through the RSS 2.0 feed. Both comments and pings are currently closed. TWC forecasts cool to cold Summer for most of the U.S this year. However the West coast is forecasted to have a hot Summer. Awesome. Peace. Let’s hope they’re wrong about the west coast. Woke up to thunder just South of The Dome about 1:15am this morning. Saw a few flashes out my window, heard 5 or 6 distant rumbles, the second one boomed pretty loud, but only got 0.02″ of rain out of it. Close, but not quite! Yet again, maybe next time? This rain is bringing much needed relief for the fire season, I hope it continues through summer. Actually rain this late in the season over here and in the cascades will worsen the fire season. Its going to create lots of extra fuels, shrubs and plants, for the upcoming dry hot summer. Just sayin. Quite a bit of rain up here last night. Probably about half an inch or so. I haven’t seen one drop of rain this week downtown. Can we get rid of this humid crap please? 60 degree lows in May is disgusting. Between 1:15am and 1:40am no fewer than 8 lightning bolts were visible in Oak Grove. Finally, some thunder and lightning in Happy Valley. Not a huge storm, and just to the south of us, but at least something. Loud booming thunder and the hardest rainfall I’ve experienced here in foothills above Sandy/ Estacada for over 1/2hr now, where’s the flash flood warning? Total bust in North Hillsboro. What a letdown. Okay, yet two hours prior to this you were posting about dry lightning and thunder for over a half an hour? How is this a bust?? need to have flash flood warning in Aloha/Beaverton…this rain is SO heavy! All neighbors gutters are overflowing and street drain is clogged! I’m at 160th…like 10 blocks from aloha and have had only a very brief rainstorm. Weird. And I was in Costco parking lot at 8:05pm…I saw it just to the SW of that location. Luckily makeup and hair not messed up. He just wants to keep that youngster look! Hearing some distant thunder (from the Garden Home area). 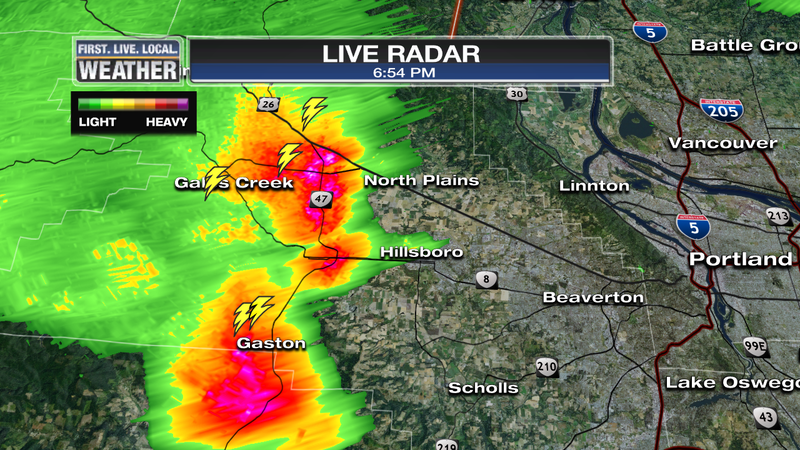 Thunder in Hillsboro, but still dry. Yawn. Not hearing thunder anymore. Finally starting to rain. Or more accurately – drip. According to the radar, the heavy part of the storm is a few blocks South of me. Bummer! Hillsboro looks like it’s about to get hammered from that cell to the NW… keep us posted.